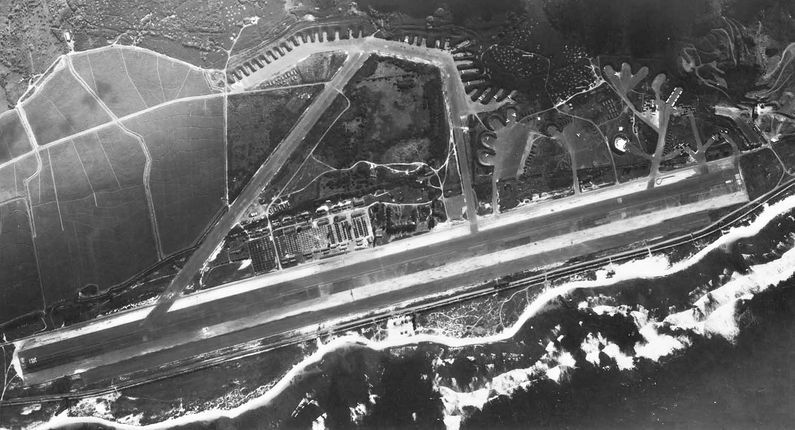 Dillingham Air Force Base (1941-1974) - A United States Air Force Base first established in 1941 as Mokuleia Airfield near Mokuleia, Honolulu County, Hawaii. Renamed Dillingham Air Force Base in 1948 for Captain Henry G. Dillingham, a B-29 pilot who was killed in action over Kawasaki, Japan on 25 Jul 1945. Transferred from the U.S. Air Force to the U.S. Army in 1974. Also known as Dillingham Field. During World War II, Mokuleia Airfield was improved to include a 9,000-foot by 75-foot paved runway, a crosswind runway and aircraft revetments. By the end of World War II, the main runway was long enough to handle B-29 bombers. In late 1946, the U.S. Air Force became a separate service and Mokuleia Airfield became an Air Force installation. The airfield was inactivated in 1948 and renamed Dillingham Air Force Base. In 1960 a U.S. Army Nike Air Defense missile launch site was built on the south side of the main runway. The corresponding IFC control site was located on a 2,000' hilltop overlooking the launchers. The two sites were operated and maintained by the Hawaii Army Nation Guard (HIARNG). The site was designated Site OA-84 and maintained 12 missiles and 12 launchers. The Dillingham site began operation in January 1961 and all the Nike sites on Oahu were deactivated in March 1970. The state of Hawaii leased some of Dillingham AFB from the Air Force in 1962 for general aviation use on a short-term basis. In 1974, the U.S. Air Force transferred the base to the U.S. Army. The state acquired a longer term lease from the Army in 1974 and in 1983 signed a 25-year lease. Location: Near Mokuleia, Honolulu County, Hawaii. This page was last modified 19:30, 7 January 2019 by John Stanton.